A mini-kit featuring a Johnny Thunder mini-fig, a baby t-rex, and some gear. Seen above left. A mini-kit helecopter with Dr. Lightening. A mini-kit with Johnny Thunder and a teeny tiny plane. Mike, the Adventurers' junior member, skims along the island swamps in this skiff mini-kit. The learned professor in his teeny tiny car mini-kit. The last mini-kit with the evil "Sam Sinister" (previously known as Baron Von Barron in the Egypt Adventurers line) and a baby t-rex. Von Barron returns with a little red sportscar that looks like a roadster from the 30s or 40s. Great looking model if not especially Lost World-ish. Mike is looking to lasso a pterodactyl from his glider. A strangely tank-like vehicle, including a pterodactyl. The Adventurers primary aerial transport. Two items in one box: first is the tank-like vehicle which, when rammed, throws a net on an unsuspecting triceratops. The second is a net trap enveloping a stegosaurus. Move 'em out! 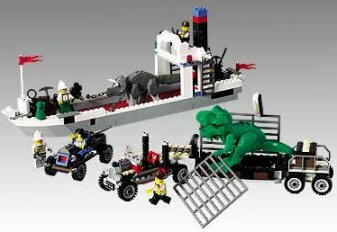 This kit includes a car, an ocean-going cargo vessel, and a heavy-duty transport truck, all to haul away a triceratops and a t-rex! Seen above right. The big kit... This is the towering complex that includes dinosaurs, planes, boats, and tons of extra bits. Box art seen below right. A collected set of 4 mini-kits: Johnny Thunder's Plane, Mike's Swamp Boat, Dr. Lightening's Car, and Sam Sinister & Baby T.
A collected set of the remaining 2 mini-kits: Johnny Thunder and Baby Dino, and Adventurers Mini Copter. A grand collected set of the All Terrain Trapper, T-Rex Transport, Dino Research Compound, and the Island Hopper. A very well done fansite devoted to the Adventurers. 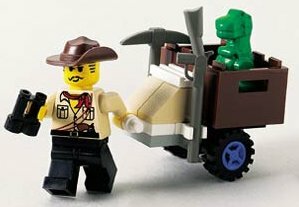 In diversifying their line of toys, the LEGO company began a new franchise in 1998 labelled LEGO Adventurers. The first wave of sets in the 1998/99 season had an Egyptian theme and features the Indiana Jones-like character Johnny Thunder and his group of heroic Adventurers. Joining Thunder in facing off against the evil Baron Von Barron and his scientist Sam Sinister, as well as the mummy Tut-Ankh-Amun, were Dr. Lightning, Gale Storm, and pilot Harry Cane. Their work done in the desert, the following Adventurers line in 1999 was set in South America, where the villains were Senior Palomar, Rudo Villano, and the Aztec chief Achoo. 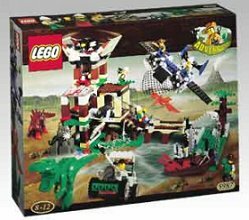 However, in 2000, LEGO really pulled it out of the bag with their 3rd Adventurers line: Dinosaur Island. For the first time, there were official sculpted LEGO dinosaurs, and these were pitted against our intrepid heroes in a senario that screamed The Lost World meets Indiana Jones. These were a fantastic set of kits with great designs and a compelling theme. Unfortunately, this wonderful line with its collection of temples, zepplins and other Pulp-era exotica wrapped up in 2003 with the Orient Expedition line.